This collection features a diverse mixture of leading ladies. Some toiled in B-westerns, others worked exclusively at the A level, a few were relegated to television. Those interviewed: Jane Adams, Julie Adams, Merry Anders, Vivian Austin, Joan Barclay, Patricia Blair, Pamela Blake, Adrian Booth, Geneé Boutell, Lois Collier, Mara Corday, Gail Davis, Myrna Dell, Ann Doran, Faith Domergue, Dale Evans, Beatrice Gray, Coleen Gray, Anne Gwynne, Lois Hall, Kay Hughes, Marsha Hunt, Eilene Janssen, Anna Lee, Joan Leslie, Nan Leslie, Kay Linaker, Teala Loring, Lucille Lund, Beth Marion, Donna Martell, Kristine Miller, Peggy Moran, Maureen O’Hara, Debra Paget, Jean Porter, Paula Raymond, Jan Shepard, Marion Shilling, Roberta Shore, Eleanor Stewart, Peggy Stewart, Linda Stirling, Gale Storm, Helen Talbot, Audrey Totter, Virginia Vale, Elena Verdugo, Jacqueline White and Gloria Winters. Forewords by Kathryn Adams, Mala Powers and Marion Shilling. Now Fitzgerald and Magers are back with a new roundup of interviews with leading ladies from B-westerns, A-westerns, and television. In this volume of fascinating and candid conversations, 51 actresses discuss the facts of life as lived on a western set—and why, despite harsh working conditions, low pay, and a host of other challenges, most of them would happily choose to live it again. 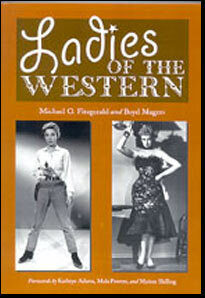 Like WESTERNS WOMEN, this collection features another diverse mixture of leading ladies. Some toiled in B-westerns, others worked exclusively at the A level, others did TV westerns. 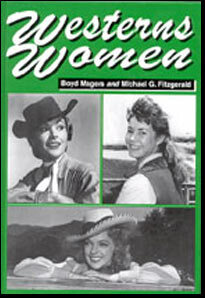 Those interviewed: Kathryn Adams, Claudia Barrett, Reno Browne, Virginia Carroll, Phyllis Coates, Louise Currie, Frances Dee, Edith Fellows, Barbra Fuller, Beverly Garland, Lisa Gaye, Jane Greer, Marie Harmon, Virginia Herrick, Kathleen Hughes, Lois January, Anne Jeffreys, Linda Johnson, Suzanne Kaaren, Mary Ellen Kay, Elyse Knox, Barbara Knudson, Ruta Lee, Virginia Lee, Adele Mara, Carole Mathews, Joyce Meadows, Colleen Miller, Pauline Moore, Dorothy Morris and Caren Marsh, Noreen Nash, Noel Neill, Gigi Perreau, Mala Powers, Madlyn Rhue, Elaine Riley, Kasey Rogers, Jean Rouverol, Ann Rutherford, Karen Sharpe, Marjorie Stapp, Olive Sturgess, Ruth Terry, Lyn Thomas, Martha Tibbetts, Yvette Vickers, June Vincent, Beverly Washburn, Marie Windsor, Jane Withers. Included among their remembrances and anecdotes, you’ll find stories and tales about Gene Autry, Roy Rogers, Audie Murphy, Charles Starrett, William Witney, John Wayne, Rex Allen, Clint Walker, Joel McCrea, Robert Horton, Bob Steele, Allan “Rocky” Lane, Lash LaRue, James Arness, Don Barry, William Boyd, Walter Brennan, Richard Boone, “Bonanza”, Johnny Mack Brown, Smiley Burnette, Rod Cameron, Yakima Canutt, Lon Chaney Jr., Republic Studios, Bill Elliott, Don Durant, Dale Evans, Eric Fleming, Clint Eastwood, James Garner, Myron Healey, Monte Hale, Buzz Henry, Hoosier Hot Shots, Will Hutchins, Jack Kelly, Alan Ladd, Jock Mahoney, Clayton Moore, Wayne Morris, Hugh O’Brian, Dale Robertson, “Superman”, John Agar, Bob Wills, Whip Wilson and many more!